Remastered album on 180-gram vinyl double LP! 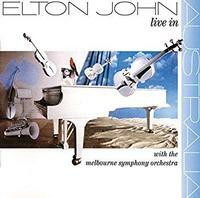 Released in 1987, the 26th album from Elton John was recorded at the Sydney entertainment Centre on December 14, 1986 with the Melbourne Symphony Orchestra. The album features live performances of "Tiny Dancer," "Candle In the Wind" and "Don't Let the Sun Go Down On Me."